Another week, another batch of nerdery from PCWorld's GeekTech blog: This week, we look at odd malware, goodies from IDF, a linux tablet hack, and a couple of developments in the world of robotics. So put on your nerdiest T-shirt, get a cup of coffee, and grab your Spock ears. 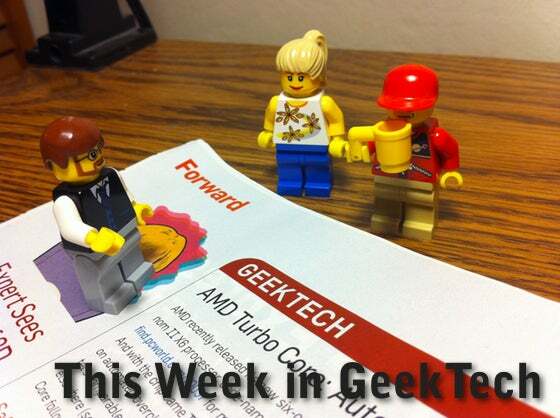 It's time for This Week in GeekTech. Intel held its annual IDF conference in San Francisco this week, and finally announced a shipping "date" (and I use the term "date" loosely) for its upcoming Sandy Bridge processors. Intel also announced an official name for Sandy Bridge: The " Second-Generation Intel Core processor". My, that just rolls off the tip of the tongue, doesn't it? Among the other wares on show at IDF was a funky swivel-screen netbook of sorts from Dell. Looks cool--even useful--but I have to wonder how much abuse that screen would be able to take. No malware is fun, but this one is especially insidious. A new trojan out of Japan will monitor your browsing habits, and it'll threaten to publicly post your history of browsing, um, certain sites unless you pay up. This, believe it or not, is only the second strangest trojan out of Japan we've seen in recent weeks; last month we spotted one that deleted your files and replaced them with image files of various undersea creatures. Go figure. Some enterprising soul took an Insignia Infocast--a Chumby-based gadget--and managed to turn it into a Linux tablet of sorts. Sure, it isn't a true tablet, but the price is right: The Infocast runs for $170, compared with $500 for an iPad. whether the financial savings is worth the time it takes to hack the Infocast is up to you to decide. Touchy-Feely, Blood-Clot-Busting Robots Are Coming! We covered a couple developments in robotics this past week. UC Berkeley researchers developed a technology that would let robots feel and actually grasp objects with a lighter touch. So maybe a Jetsons-style chorebot isn't so far off after all? Meanwhile, how would you like to have a nanobot surfing through your blood vessels? If you're from the Institute of Robotics and Intelligent Systems, you probably won't mind. OctoMag is a system under development that injects a tiny half-millimeter-long robot into your bloodstream. A set of large coil magnets guide the nanobot through your blood vessels, which allows it to perform procedures such as removing blood clots from the small vessels in your eyes. Slightly freaky? Quite possibly. A feat of modern medicine? Heck yes. Until next week... follow GeekTech on Facebook or Twitter, or subscribe to our RSS feed!